Last week I watched a woman in a store buy a $26 “oven liner” and it damn near gave me a bellyache watching her do it, knowing there was no need to waste good money like that. I assumed everyone’s mother taught them to line their oven with aluminum foil, but upon a formal survey (read: I Gchatted three people) it appears this tip is in need of revival. For me, one piece of foil will last for ages until inevitably a hunk of cheese falls off a frozen pizza or a tray of lasagna. You would think the sides would eventually get dirty, but I have not found that to be true. In fact, I just gave my oven the finger smear test and I’m telling you, it’s clean. Totally clean. Stick it in your ear clean. And that is saying something. After cooking in that thing for 3-5 times a week for two and a half years, you’d figure it was due for a scrub. But no. Unless you are cooking hot bubbly sludge of some sort, the foil on the floor trick should cover it. Go figure? Foil! Honestly, I don’t know how people are functioning with out this. One time I forgot to replace the foil and something spilled and it was a molten, smokey, charred up mess. Then I tried to clean it while the oven was still warm, burned my forearm and ruined my sponge. Ain’t nobody got time for that. Get some foil. You’re welcome. Huh! That must be a crazy hot oven. Aluminum has an unusually high meting point (I think over a thousand degrees Fahrenheit?) that’s why they use it to make pots and pans and such. That oven must be crazy efficient! Maybe the quality of foil matters? Maybe cheap foil uses less aluminum and more of something that has a lower melting point? Like low enough that it melts while broiling? It is completely unrecommended, unsafe and detrimental to your oven to line the bottom with foil. Look it up on a reputable sight. Heidi’s right. My oven has an exposed heating element in the bottom and when I tried this a while back the foil caught on fire. Doh. My work-around is to put foil on the second rack below what I’m cooking, or put my pie dish or whatever on a baking sheet if I’m worried about something cooking over. Either way, do what you must to avoid having to clean the oven, because, mercy. That’s a miserable task. Sorry, guys… aluminum has an astonishingly low melting point, just above that of copper. (I worked at Alcan Aluminum a couple of times). But unless the oven is regularly over 500 degrees fahrenheit, it should not melt. You can overheat and burn out your elements if you have an electric oven. The dollar store has slightly heavier foil for oven bottoms and these tend not to burn out elements so quickly. I have a gas oven so that’s not a problem for me. Another tip… if you have badly greased pans, put them into the oven when running a cleaning cycle (if you do). They’ll come right clean. I use heavy duty foil on the bottom of my oven,have for years, I also have a gas stove and it has never melted. Yesiree! Been doing this for years. Last time we moved house i had to clean up after someone who didn’t know. what a mess! Simple, yet super effective! I over looked this, thanks so much for this! I also have aluminum lining the drip pan under the (electric) stove top coils. Ugh- I hate electric stoves, even my cool looking glass top. I really miss a gas oven, where you can put tin foil down  My tip is: always take your racks out before you run the cleaning cycle! Exposed heating elements are only attached at the back, so gently lift it up in the front and slide the foil under it. By the way, $26 for a liner would make my head exposed. You can readily find silicone oven liners for under $5. Just wipe clean! I use the non-stick foil in the bottom and lift up my element to get the foil in there really well. Use long tongs to help make sure all the foil is down and not touching my element. BUT the best is that whenever cheese oozes from the pizza, you just use the tongs to pick up and out of there. I love non-stick foil!! My oven tip: don’t leave a lasagna in your oven during the cleaning cycle. You Wii ll get.a.lot of.smoke and a giant briquette made of pasta and cheese. You.Will how her meet the neighbors. I dont know whether or not their is any truth behind this, but someone once told me putting foil on the bottom of your oven can actually damage the oven enamel. Reason being that the heat gets trapped between the foil and the bottom of the oven and that extra heat in time causes the enamel to weaken and crack. Any truth behind this guys?? This is brilliant. How did I not think of that earlier. Thanks for sharing. I had always lined my electric ovens with aluminum foil on the bottom to aid clean up, but my resident mgr (I live in an apt) tried to inform me that doing so can blow up the oven element. I do place my foil lining underneath the element on the bottom of the oven. My broiler element is on the top inside of the oven. Any thoughts? Even with foil in bottom of the oven, we get a very messy oven, when cooking Pizza. The heavy duty foil liners will take care of the oven bottom, but what to do about the sides ??? 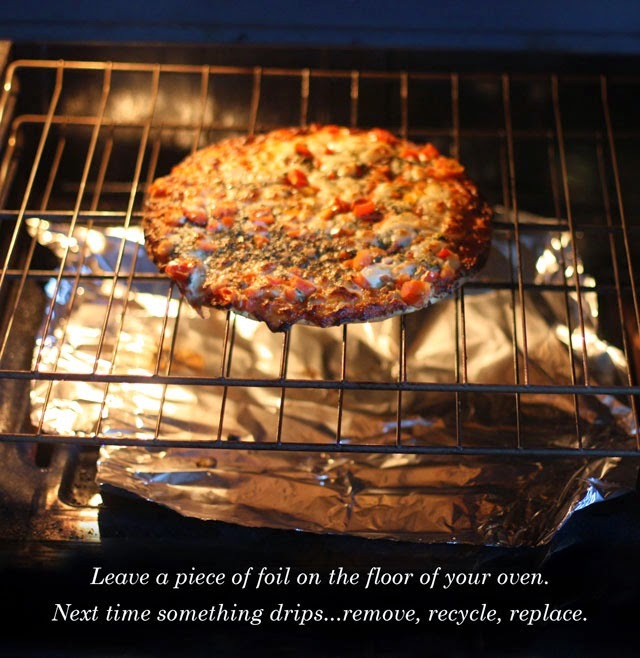 is easily solved when preheating a Pizza stone to 450 – 500 degrees prior to placing the pizza in the oven. Any solutions to keeping the oven sides clean, would be gratefully appreciated..
What about the glass? 🙂 I am in the business for quite some time and it is never only the bottom that is dirty… But then again depends on the usage and how messy your favourite meals are. Still – it’s a good tip. I used to recommend that to clients but they’d never listen. Oh, well. Next time I’ll just give them your post and let you do the persuasion. YES !!! THE GLASS !!!! WHY IS IT NOT SEALED OR SOMETHING ? ?